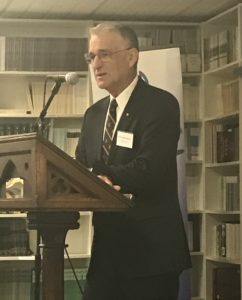 We recently reported on our one-day forum, co-hosted with the Australian Institute on International Affairs, titled ‘Security3: Food Security, Biosecurity and National Security in the Melanesian Arc’ stating that we would be including information from the forum in our submission to Australia’s foreign policy white paper. The Fund has now submitted its report and a copy is available here. Our submission argues that global food security is essential for international peace and security and serves Australia’s national interests. We suggest that a sharper focus on food insecurity drawing on the work of Australian scientists in agricultural R&D, the excellent work and partnerships of the Australian Centre for International Agricultural Research, and the ability of our farmers in harsh and changing conditions to adapt and adopt new technologies and farming practices, would enrich a new foreign policy with a more uniquely Australian character. The submission goes into recent history to provide evidence of the strong correlation between food insecurity and the outbreak of conflict, noting that food insecurity has led to widespread malnutrition, increased poverty and food riots. It has thus been a trigger to societal unrest and revolution. In reviewing the recent literature on the drivers of conflict, we noted in relation to North Africa and the Middle East that the Arab Spring uprisings were viewed as a culmination of shortages of food and income, unemployment, poor governance, corruption and aging dictatorships. Most of the studies reviewed cited per capita income, inequality and poor governance as major determinants of conflict. Results from our review, however, also identify food insecurity at the macro and household levels as the main cause of conflict in the region. Acknowledging that the Australian Government has set promoting prosperity, reducing poverty and enhancing stability as the central tenet of Australian aid, our submission argues that to deliver on these ambitions, as well as the sharpened focus on the Indo-Pacific region identified in the Government’s announced reforms, Australian aid should have a sharper sectoral focus on food security. This focus could constitute a cornerstone of a new Australian foreign policy. We suggest an increasing proportion of the aid budget should be apportioned to food security, with a focus on research for development. It concludes that by enhancing food security for the developing countries through investments in international agricultural R&D, Australia can indeed promote prosperity, reduce poverty and enhance stability. Such investments can also directly benefit Australian agriculture and our regional and rural communities. We have offered to appear before hearings.